The use of acupuncture as a medical technique is an evolving system of accumulated knowledge and understanding. While the ancient texts provide valuable wisdom, many great practitioners have expanded the medical understanding over time. The same is true in the martial arts. Those who study various point striking styles often refer to the acupuncture points as a reference. It is often assumed that fighters took the knowledge of medicine to understand how to injure. This is the same logic behind asking a surgeon where best to stab someone. What if the development of knowledge went the other way? What if medicine learned treatments from the martial applications? The idea seems absurd at first glance. However many advances in medical science have come from this line of thinking. Many powerful drugs are in fact poisons that through understanding have been turned to beneficial use. In theory therefore, it might have happened that various martial strike combinations were found to have particular effects. Understanding how those effects happened, would add to the development of medical understanding. In both medical and martial systems there would then develop codification of these strike/treatment combinations so that the knowledge could be passed on. If there is similarity in this codification, then this creates a "which came first- chicken and egg " conundrum. Did medical application lead to martial application, or vice-versa? The answer to that question should be addressed by historians and may never be truly resolved. That said, there are some intriguing clues that would indicate that at least in one area of medicine there was some martial influence in the understanding and medical application of some acupuncture points. The area in question is what are called the extraordinary or extra channels or vessels (EC). These channels through the body linking various acupuncture points are understood to serve as conduits to control excess life energy. They are often seen as like river flood plains providing a connection between the flow of energy and other areas when the need arises. Based on what we know of ancient texts, these channels were mentioned in medical texts as far back as 400 BCE . Known surviving texts through the ages provide commentary as to the progression of greater understanding of application of the EC and of the various controlling acupuncture points. As early as 100BCE there was an expansion of the understanding in medical commentary . Major refinements of medical theory regarding the EC can be seen in medical texts, starting just prior to 1300CE and with major refinement around 1440CE and arriving at our modern understanding of these channels with a text from about 1600CE . These texts trace a series of steps in understanding of the EC and later the points that are used to control and manipulate energy through them . There are several clues that indicate at least some overlap into the martial arts. The names of channels and points often were memory devices to help someone remember some aspect of proper use. Many of the names associated with the EC seem to have a practical, structural, "martial like" influence. This is especially obvious when compared to other channels that are named simply for organ systems. The names of the points used to control the EC bear no suggestion of martial application. This would seem to suggest that the channels were understood to have specific functional properties related to martial application, and the points to control those channels were identified after the points had other established uses. The more interesting aspect is that over time the channels and their control points were paired in combinations that could easily be seen as point strike combinations that exist in many martial arts katas/forms. These combinations may have been passed down through the katas. Observed effects of these combinations may have expanded the medical knowledge of these combinations, with medical theory then driving the development of other applications. A martial attack (strike or grab) to an EC control point or attacks to paired combinations of partnered EC control points, creates a situation where the channels and points controlled by those control points are unprotected and open to be influenced (attacked). The most obvious of these combinations is one that shows up in many arts. 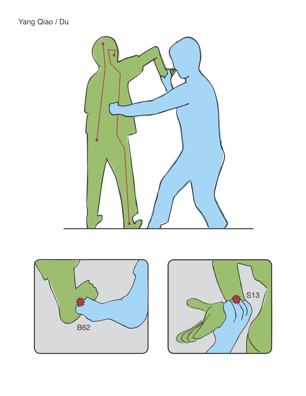 The defensive move involves a step into an opponents strike blocking the medial aspect of the arm and a counter strike to the torso of the attacker (often called a step in downward block-reverse punch). All three moves naturally target an EC control point combination. The step can easily be a kick to K6 on the ankle, the arm block a strike to L7 on the wrist, with the counter strike can be easily targeted to numerous points controlled by the channels that are associated with those points. Illustration 1; Blue counters a punch by striking Lung 7 and Kidney 6 which activates the Yin Qiao and Ren channels and allows targeting of points on those channels. Illustration 2; Blue counters a strike with a step-in rising block that strikes Pericardium 6 and steps on Spleen 4. This activates the Yin wei and Chong mo channels and allows for targeting of points along those channels. Illustration 3; Blue steps and blocks to the outside of a punch, striking at San Jiao 5 and Gallbladder 41. This activates the Yang wei and Dai mo channels and allows for the targeting of points on those channels along the side and belt lines of the body. 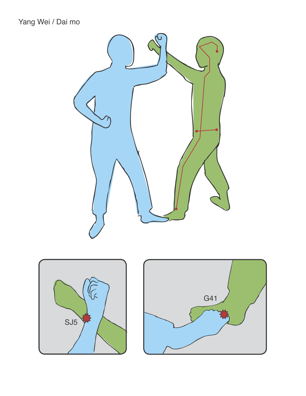 Illustration 4; Blue counters an attack by Green by grabbing the wrist at Small Intestine 3 and twists Green opening the ability to kick Bladder 62 thus activating the Yang Qiao and Du channels. The turned position of Green allows for targeting of points along the Yang Qiao and Spine/Du channel. 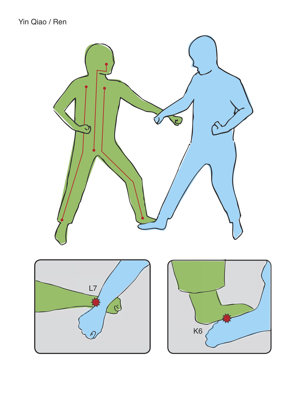 There is a definite pattern of acupuncture point combinations with martial sounding channel energetic names that match with common martial arts strike combinations. This brings into question whether martial arts drove the advancement of medicine, or whether medicine drove the advancement of martial arts.